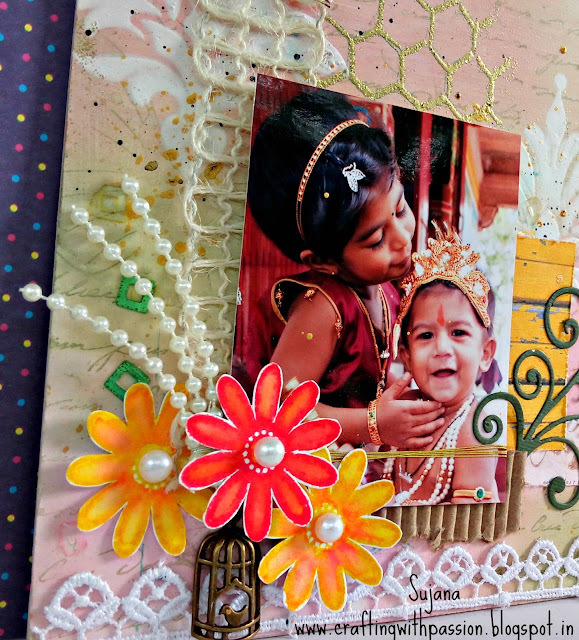 I am soo excited to share my first mixed media layout. This pic was taken during my son's first tonsure ceremony. Lots of celebration and one of my fav pic. I really enjoyed playing with different mediums and am now very keen on collecting more sprays & pastes 😀😀😀 A crafters' heart will always want more right? I started my layout on a piece of foam board measuring 8 x 6 inches. I dint have a canvas board. I layered the base with a coat of gesso... surely gesso gives the needed texture. Then directly on the gesso(after drying ofcourse) i started sponging peeled paint and worn lipstick Distress inks. Once satisfied, i stamped the bg with a script stamp with Hero arts shadow ink (green colour). Wanting to add to the bg, I choose a stencil that i once picked up from my local stationery shop and added gesso through it. I guess any textured/modelling paste would have given more volume but for more gesso did fine for me. Still not satisfied i splashed some black and gold paint on the bg. And now i was satisfied. The bg was the scariest part. Having been done with it, I arranged and rearranged the elements to my safisfaction. The flowers are stamped on Papericious Sigma cardstock and coloured with Distress inks. 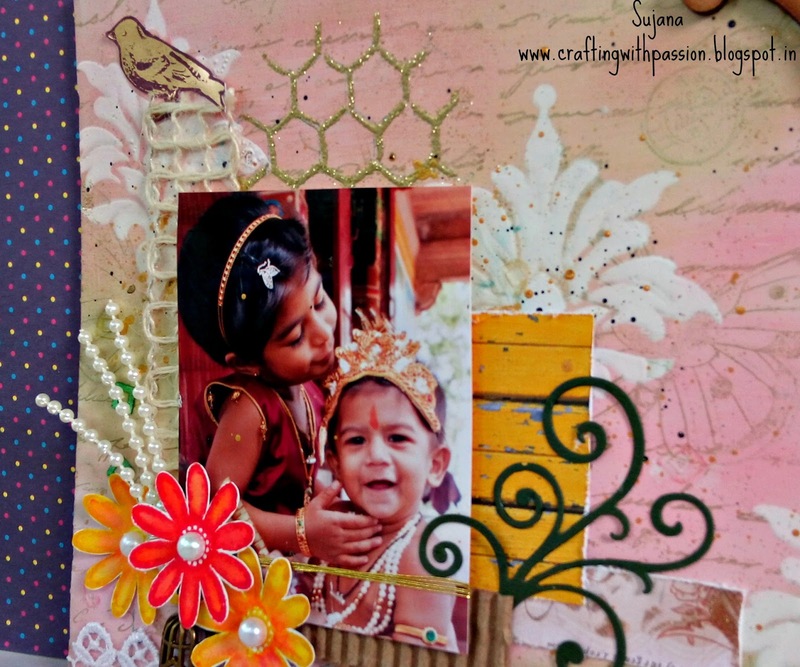 Loved the beautiful smooth cardstock. Perfect one. I also added some papericious green square sequins. By mistake a sequin fell off wen it was half dry and i found that it made a gorgeous texture with the fevicol. So i scrapped off a few more sequins to reveal nice texture. The bird is paper pierced from a DCWV Mariposa stack. Everything else is mostly from my stash and scrap. 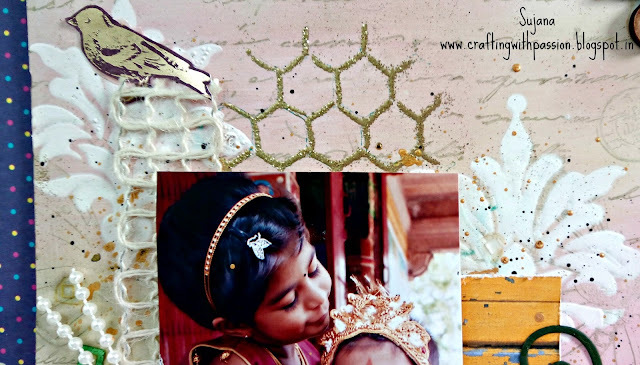 Beads, diecuts, corrugated wrap sheet, gold thread, lace, charms and pp. ok thats it. So did you like it. Any ideas or tips for this novice at mixed media? Thanks for dropping by today and do share ur comments. hello sujana! this is so pretty, luv the details...fabulous. super sweet photo too! I am so glad you played along with us at simon says stamp wednesday challenge! Lovely MM layout! Great photo too. Thanks for playing with Papericious challenge and good luck! What a cute picture to make a layout with! Thanks for playing along the Papericious Challenge!